Born to a wealthy Sudanese family, she was kidnapped by slave-traders at age 9, and given the name Bakhita (lucky) by them. Sold and resold in the markets at El Obeid and Khartoum, finally purchased in 1883 by Callisto Legnani, Italian consul who planned to free her. She accompanied Legnani to Italy in 1885, and worked as a nanny for the family of Augusto Michieli. She was treated well in Italy and grew to love the country. An adult convert the Christianity, she joined the Church on 9 January 1890, she took the name of Josephine as a symbol of her new life. She entered the Institute of Canossian Daughters of Charity in Venice, Italy in 1893, taking her vows on 8 December 1896 in Verona, Italy and serving as a Canossian Sister for the next fifty years. Her gentle presence, her warm, amiable voice, and her willingness to help with any menial task were a comfort to the poor and suffering people who came to the door of the Institute. After a biography of her was published in 1930, she became a noted and sought after speaker, raising funds to support missions. Her feast has been designated the International Day of Prayer to Stop Human Trafficking. Born wealthy, the son of Angelo and Eleanor Mauroceni Emiliani. His father died when Jerome was a teenager, and he ran away from home at age 15. After a dissolute youth, he became a soldier in Venice, Italy in 1506. Commanded the League of Cambrai forces at the fortress of Castelnuovo in the mountains near Treviso, Italy. Captured by Venetian forces on 27 August 1511, he was chained in a dungeon. He prayed to Our Lady for help, was miraculously freed by an apparition, and hung his chains on a church wall as an offering. Mayor of Treviso while studying for the priesthood. Ordained in the spotted-fever plague year of 1518. Cared for the sick, and housed orphans in his own home. At night he roamed the streets, burying those who had collapsed and died unattended. Jerome contracted the fever himself, but survived. Founded six orphanages, a shelter for penitent prostitutes, and a hospital. Founded the Order of Somaschi (Company of Servants of the Poor, or Somascan Fathers, or Regular Clergy of Somasca) c.1532, a congregation of clerks regular vowed to the care of orphans, and named after the town of Somasca where they started, and where they founded a seminary; the society was given approval by Pope Paul III in 1540, and continue their work today in a dozen countries. Believed to have developed the question-and-answer catechism technique for teaching children religion. 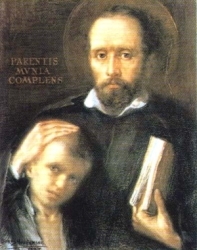 Declared the patron of orphans and abandoned children in 1928 by Pope Pius XI. Founded the Handmaids of Merciful Love in 1930. Founded the Sons of Merciful Love in 1951. Born to the Italian nobility. Vallombrosan Benedictine monk. Accused of simony, Peter under went a trial by fire - he had to walk through fire, and if he was innocent and God was on his side, he would emerge unharmed. Peter's abbot and spiritual teacher, Saint John Gualbert administered the test; Peter survived, was exhonerated, and was know thereafter as Peter Igneus. Abbot of San Salvatore Abbey in Fucecchio, Italy. Cardinal-bishop of Albano. Papal legate to Germany for Pope Saint Gregory VII in 1079. Papal envoy to France in 1084 to promulgate the order of excommunication against Henry IV. Bishop of Pavia, Italy from 381 to 397, chosen for the see by Saint Ambrose of Milan. Attended the Council of Aquileia in 390 and the Council of Milan, signing the letter condemning the theological errors of Jovinian. A tireless evangelist for the faith in his diocese. Educated at Benevento, Italy from age 12 by Archbishop Milo. Founder of the Benedictine house of Grandmont in the forest of Muret, in Limousin, France. Abbot of the house, though never formally a monk. Poor but pious youth from the south of England. Cared for his invalid mother following his father's death. Shepherd, spending his time with the flock in prayer. Built a church near his property near Steyning, Sussex, England. Miracle worker in life and afterward. Sister of Saint Congar. She lived a life of quiet sanctity and private vows. Once when she visited her brother in his hermit's cell he refused to see her, fearing that even the sight of his sister would prove a distraction. To prove her holiness, she summoned a wild boar, and miraculously caused it to obey her like a pet. Her brother accepted the event as a sign. Poet and pilgrim who roamed the memorials and shrines of Ireland, collecting and preserving information about and relics of the saints. He finally retired to the Clonmore monastery who inherited his collection of relics, and who enshrined Oncho as well. Born a princess, the daughter of King Oswy of Northumbria (part of England). She was offered to God as a child at the convent of Hartlepool. Nun at the double monastery of Whitby Abbey with Saint Hilda of Whitby. Abbess of Whitby. Martyred in the persecutions of Decius for refusing to sacrifice to idols. Bishop of Milan, Italy in 567 during a time when there was theological conflict with the Arians, battlefield conflict with invading Lombards. Honoratus opposed both, but was driven into exile and never returned to his see. Courtier. Hermit on Mount Voge (modern Paulberg) near Trier, Germany. Monk at Tholey, Germany. Bishop of Verdun, France. Daughter of Duke Boleslav of Czechia. Founded the convent of Saint George in Prague (in the modern Czech Republic). Bishop of Besançon, France. Friend of Saint Columbanus of Luxeuil. 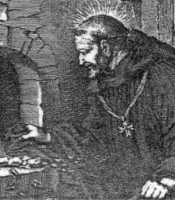 Augustinian hermit. Theologian. Exceptional professor of Holy Scripture within the order. Brother of Saint Winwaldo and Saint Guethnoc. Monk. Founded a monastery in Brittany near the sea and led it as abbot until his death. Community of 5th century monks at the monastery of Saint Dius at Constantinople. Imprisoned and martyred for loyalty to the Vatican during the Acacian Schism. An unknown number of Christians murdered in early 6th-century Persia. Legend says that so many miracles occurred through the intercession of these martyrs that the king decreed an end to the persecution of Christians.